So Morgan James is one of my favorite singers right now. And boy, can she sing. I first became acquainted with the singer through Postmodern Jukebox, a very cool and eclectic group that produces modern songs in different historical styles. Many different singers have been featured and Postmodern Jukebox has accumulated an impressive number of views for their videos. Recently, they released an album in 2016 entitled The Essentials. 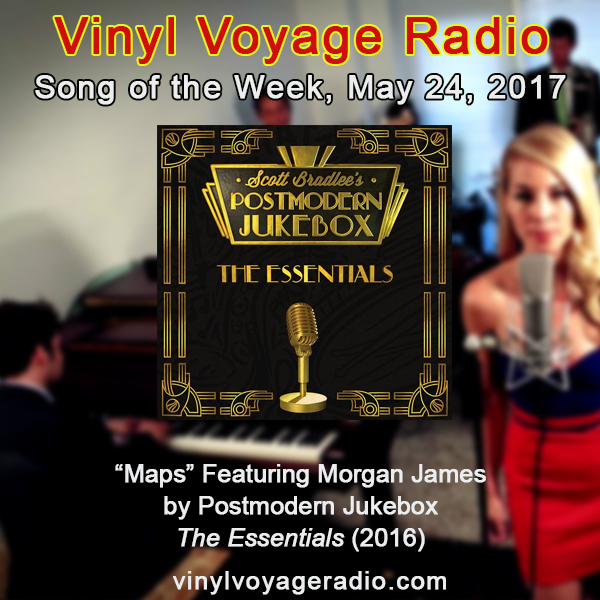 Morgan James is on this album singing a 70s soul-like version of Maroon 5's 2014 hit, "Maps." This version is the Song of the Week. Morgan James is an amazing singer. Give her Youtube page a listen. You can catch new episodes of Song of the Week every Wednesday on Vinyl Voyage Radio, played at 10 AM and 10 PM Central time. Antique Audio, Episode 1: "Black and Blue"